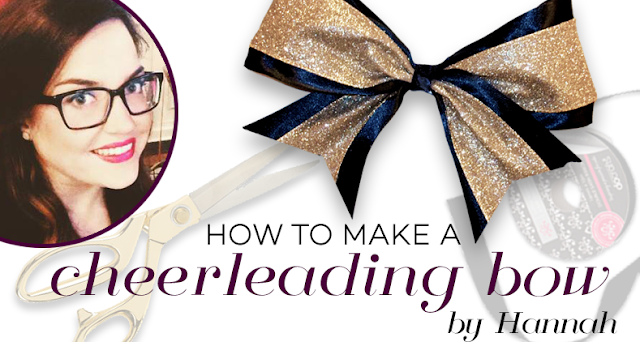 CheerandPom Blog: Cheer and Pom DIY: How to Make a Cheerleading Bow. Hey guys! Hannah here with an amazing tutorial for you! You can never have too many cheer bows! Am I right?!? But let's face it, sometimes they can add up in cost without even realizing it. So I'm here to show you how to make a cheer bow that will not only save you money, but is incredibly cute and totally customizable to whatever colors and style you want. 2" - 3" wide ribbon 30-36" long. This will be for the main part of the bow. 3/4" wide ribbon approximately 6" long. This will be for your accent ribbon (the middle knot). For the main pair of the bow, you'll need 1-1/2" - 2" wide ribbon. Personally, I like to work with more ribbon than I need just in case. The ribbon in this tutorial is 36" long, but I definitely cut a couple of inches off when I finished. I also used two different ribbons to make it a little more unique, but one ribbon color will totally work. If you're using two different colors, this is the step where you will glue them together. The second step can be a little tricky. The easiest way to explain it is to fold your ribbon together like a pretzel. Once you've got them folded like that, hold the pieces together and adjust the bow until its the right size and equal. Once it's the size to what you want, all you have to do is pinch the middle portion together and hold. While holding that portion, slip the zip tie underneath the middle of the bow and slowly start tightening it. That's right, slowly, as you slowly tighten it you'll need to keep adjusting the bow to make sure you don't lose your desired size and shape. Once it is all the way tightened, clip off the rest of the tie with your scissors. Take your accent ribbon and using the hot glue gun, secure the end of the ribbon to the pointy part of the zip tie. Once secured take your hair tie and repeat step 4 on top of the accent ribbon. Once the hair tie is secured in place, wrap the rest of the ribbon around the center of the bow while threading it through the hair tie loop. Keep wrapping until you are out of ribbon and then secure the end with a little bit more hot glue. Now for the finishing touches. Flip your bow over and trim up the tails of the ribbon. To avoid fraying edges, it is usually best if you cut the pieces into an inverted V.
And that's it, you're done! Told you it was super easy. How did it work for you? We wanna see how your bow turned out. Snap a picture of your cheer bow, tag us, and use #CheerandPomBow on Instagram or Twitter! If you still need help with making it look perfect, comment below with your questions and we'd be happy to help! The video for how to make a cheer bow is also posted below!